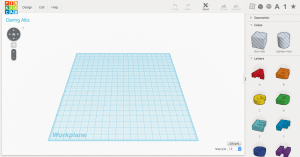 It is Tech Tuesday and it’s time to do a Tinkercad 3D print software review. 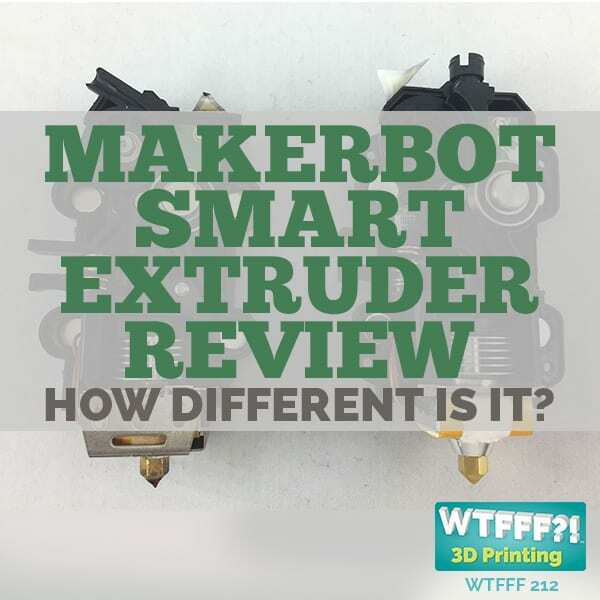 We have been doing a lot more reviews lately of different things just like the Battle of the Minis with the mini 3D printer reviews, and we have been doing those mostly on Wednesday more than Tuesdays. 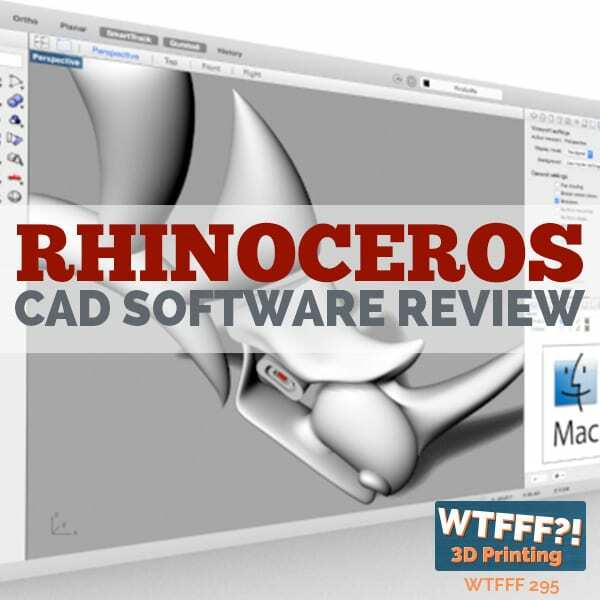 We then decided that we need to be reviewing some popular CAD software packages because we had a lot of questions about that. Today is going to be the first in the series, as once a week we are going to address a new CAD software and we are going to run the gambit with the things that are free and more entry level CAD programs, all the way to more professional and not free CAD programs because they all deserve some investigation and attention. We are going to start with Tinkercad which is something that we have used with Lannea, our daughter who is 7 years old now. She is a Tinkercad 3D print software user or tryer might be a better word for her experience level, and she started at age 6. She is learning to CAD which is exciting. She is using it so that is an accurate statement but she is not a heavy user of it. Tinker CAD 3D print software is completely free and is an entry level program which is very much a visual program. It does not have heavy menus and commands. It is meant to be simple, visually intuitive, and the tools are out there. There is a sign bar of different features and I am going to run on some of those in a little bit. Tinkercad 3D print software is free and is online. To use this software, you need to have an active internet connection. You can’t do it offline. You cannot use this program in that sense because you need to have an active internet connection. You can’t use it with an iPad. 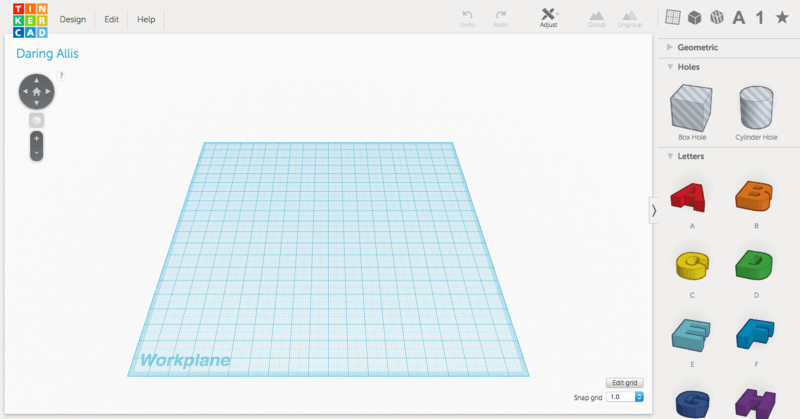 You have to use Tinkercad 3D print software with a mouse or a track pad. It is certainly a lot easier to use with a desktop computer. I haven’t tried it on an iPad recently. Tinkercad 3D print software is intended to be used on a major browser on a desktop machine because there are so many functions that your typical track pad or keyboard has. A lot of CAD programs give you multiple windows in which you can see the environment that you are building things in. In Tinker CAD, you don’t have a top view, a side view, or a rear view. You have one 3D environment that plugs you into when you start a new project. It is a great program because you can create new projects and save them online. Everything is saved there. You create a project and you can view things from the side view and you can also change that wherever you want. They also have a grid on the floor that helps you see that. 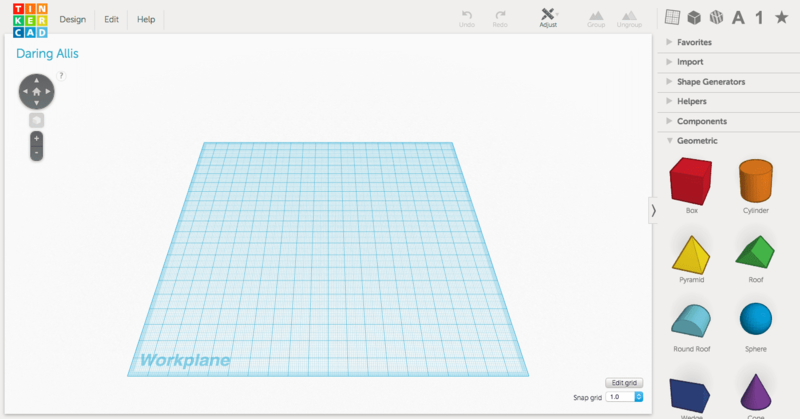 Tinkercad’s 3D world is a grid that gives you a sense of where your object is. The tool bar on the left gives basic three dimensional shapes to use as a starting point. It is a program that is made to build things from the primitive; from shapes that exist or they also have some shape generators that some are created by Tinkercad themselves. There are also some user generated ones in the community which is a little more involved to do that. There are lots of different primitive tools of which you can create all kinds of different shapes. Primitive shapes like cones, cubes, cylinders, rings, and others. 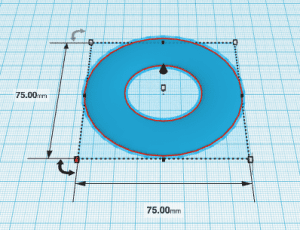 There are some that are created from the Tinkercad 3D print software community which they call the circular trapezoid. It is a race track shape which has a circle on one end in the other. And then there are different kinds of tubes and pyramids. It is great to be teaching them on shapes and things, but you want to make things. You go in there with a mindset of wanting to make something. For the race track, we had trouble with this when we were working with Lannea using Tinkercad 3D print software, and trying to find something that would work like a crown in which she could create points on them and do added things to it. But there wasn’t anything shaped in that direction which was why we had to move something and shift it. It was difficult for us to get her to understand how to do that herself. Especially for a young kid to learn on how to use a computer for the first time, it is definitely limiting. 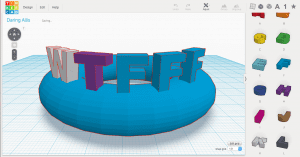 I think Tinkercad 3D print software is a gateway for CAD 3D printing for students. Later this week, we will have an interview with EduCraft who teaches a summer camp about 3D printing. They use Tinkercad and they are teaching kids with it. I think that that is a good place to start. But once they get bored and grow beyond that really quickly, and then they will go into something more advanced. Then they will have the ability to create whatever shapes they want. It will expand their world and take them a little longer at the same time. 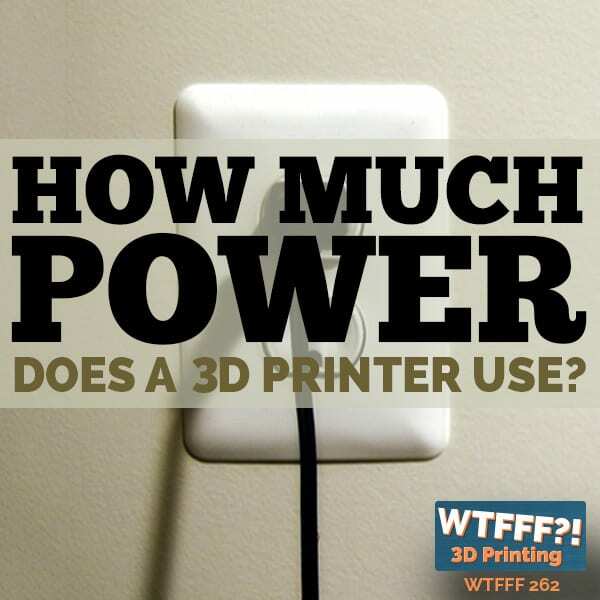 The developers of these programs like Tinkercad 3D print software and others, get into their own little worlds of knowing too much information, which they don’t think like an incoming newbie. They come in there thinking on how a child can approach this program. I think there isn’t anything that works to that standpoint of 5, 6, and 7 year olds who want to come in and say, “I just want to make a crown, a shield, and this.” Having things become more obvious for them on how to use them is what is happening here. Once they start playing with the program and dragging shapes in and manipulating them, making them more dimensional, they are learning something. If they give up because it is so hard to create that core beast shape for them, then they are going to give up too fast. That is where I want to stage-gate them into this system. That is my desire as a parent. Tool menu to upload and save. I can understand why all CAD programs have a certain kind of focus. I don’t think any of them can be all things to all potential users. I wasn’t asking them to. I am saying that if you are going to be at this basic level, then let us be basic. Let us gear them up for the next one. What I do love here is the idea of having a commonality and language that you are learning along the way. As you grow up, you still understand that this tool menu means this and this looks that. The language doesn’t change through the years. Several languages does not change, but several kinds of programs like ones that are more parametric and solids based that have certain terms that are more in number. What I really wanted is that your very first entree as a child should be immediate gratification without doing the immediate gratification which is just download and print. That is a whole different level that we have to talk about. It is a creation mode but we want a more immediate gratification to actually getting the “what” for a child. For that, I think it may need more than CAD software. You also need a good library. We have been in touch with a company who is currently running a Kickstarter right now called MiniToy. We saw them at CES and they have told me in an email that they are sending us one for review. They really said that they are shipping it. If you go to the MiniToy page on Kickstarter, you can see a great video there that shows you what you are trying to do. They are trying to make it playful and fun. It also gives an immediate satisfaction of being able to create something very quickly. It is something that has a lot of clipart, but you can also modify it if you want to. It is all tablet-based for sure too. 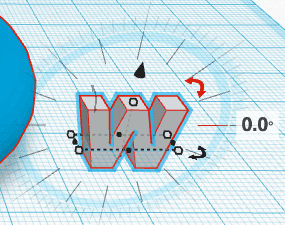 Tinkercad has some “clipart” letters to use. The problem that I see with these companies is that they have their mind in their world already. They then wanted to make a dumbed down version and that is what they end up doing. That is where you get concerned with the fact that your clipart and things that are putting in there are not kid friendly. They are just designed to be the simplistic version of something that you need to know you are going to need eventually. I think it is very hard for adults to create this software and put this on the minds of kids, especially that none of us that have used CAD in this modern world who would be in a position today to code a CAD program, has made available to us as kids. We did not experience learning it until we were young adults, if not actual adults. You are also not consulting with the right people as software developers or hardware developers who have a library and some interface in there. You must consult with someone who knows nothing about CAD and see how they are going to approach it. What is the first thing that they are going to do? What do they want to make? We are talking about reviewing the Microsoft HoloLens video and the whole thing we saw online. The reality is that the whole intention of that is that you will just be physically using your hands to put things together like how you do Lego blocks. That kind of gratification of just sticking things together is what makes it interesting. But if the thing that you are sticking together is just a cone and a sphere, that doesn’t make sense. You can also import your own 2 dimensional shape or 3D shape made from another computer if you wanted to, but you then have to learn some of the software to do it. Yes you have all that good stuff, you can cut holes in them, but this is introducing kids to the concept of subtracting different kinds of geometry to other kinds of geometries. 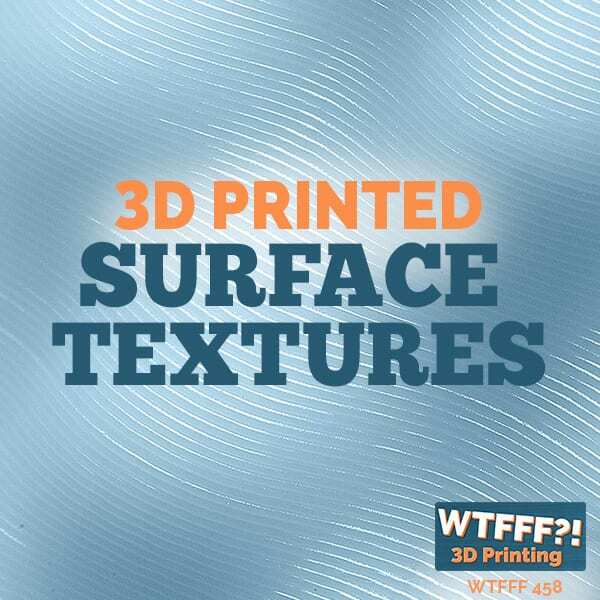 It also has letters of the alphabet that are printed in 3D numbers. There are also other bold shapes like a star and a heart and also diamonds. 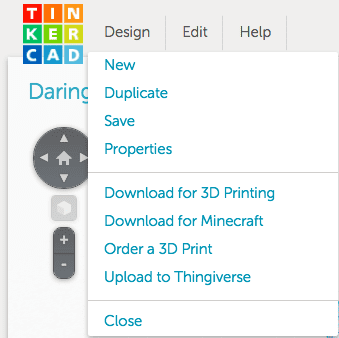 There is also an interesting part with Tinkercad 3D print software where they have the section called Connectors. These are primitive shapes that are actually like ball and socket type of joints. You can create a character out of these primitive shapes. You may want to have legs and let them articulate a move, they actually got some ball socket type of joint components that you can add to pieces. When you print them, you can put them together. Added a hole to the circular shape with the hole punching tool. That is a nice thing that Tinkercad 3D print software did which is a gateway to constructing more complicated things and making pieces that can actually snap together. I like what they are trying to do. I am not a kid. Will I be satisfied for a long time? I don’t know. Our daughter has certainly used Tinkercad 3D print software several times and created things that we have printed because we exported it to a particular file that can be sliced through whatever 3D printer you are using, so you can export an STL file. I think it is not a bad place to start, especially given that a lot of the software out there. I like it because it is free and is very accessible to anybody. You don’t have to worry installing it on to your computer and worrying all about the compatibility problems. If you got a web browser, you can use it. 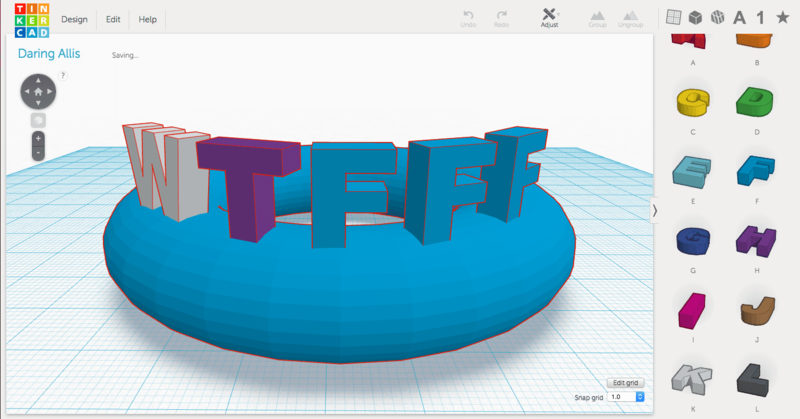 I think Tinkercad 3D print software is a great entry level CAD program. I just think that there is something that needs to be inside before that. We need something that says, “Let’s create a pottery app.” One of our friends is involved as one of the founders of Cricut, the vinyl laser cut machine. We were sitting at a breakfast table with them and he was showing us this very cool app that he plays on his phone that his kids introduced him to, and it is called Let’s Create! Pottery. There is a pottery wheel and you are making your own shape. You manipulate it with your finger and you speed it up and slow down. You then fire it, decorate it, and then glaze it. It is really very cool and satisfying. You then put that up in the open market and you get points for that. It has like a game that goes on with this. He takes his phone away multiple times because it was addictive. That to me, if we can get something at an entry level that is really addictive for kids to be able to do it, and then it can be outputted in 3D printing where it’s not going to go terribly wrong, that to me is something that I want to learn. Features like that can be added and programmed into something like the Tinkercad 3D print software. It can always be improved and enhanced and I am sure it will continue to be. This is kind of why we started the podcast to begin with, is that it has a steep learning curve. It is too easy to lose along the way if there is not gratification and positive reinforcement of things that you are actually creating. 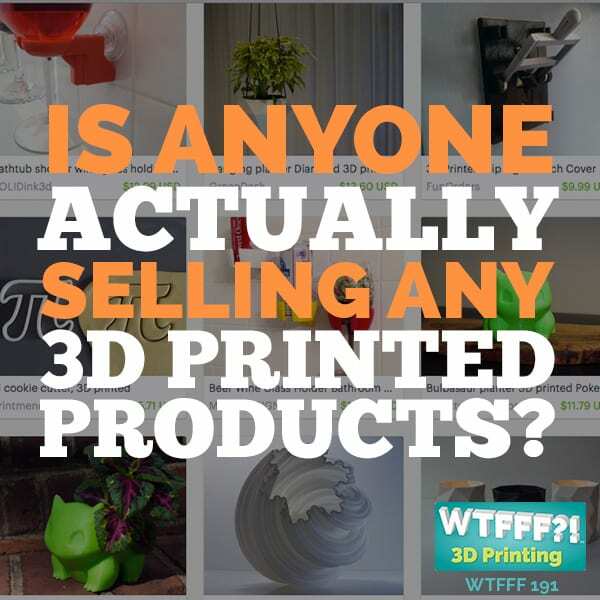 The whole time of what you really want to be doing is 3D printing, and you are busy doing stuff that doesn’t 3D print, it is just frustrating. I think that is where a lot of companies rely on tutorials that are created by others. With Tinkercad, we know our friend John Bolka had created a whole video series meant to teach kids making things with Tinkercad, and being successful. He produces a very fun video. When our daughter was using them, she has her iPad running YouTube beside her. She would be trying to copy what he did on the computer. She enjoyed doing that, but I think a lot of programs out there think more of providing software that has all these capabilities and then having a separate class or video tutorial series talking about how you do things. That is not usually fun for a kid to do, but that is how they leave it. I have wanted to download the app to my phone but I was afraid to because I think it would be too distracting. This is the tough thing, I don’t expect there to be a lot of great satisfaction expressed to us from our listeners about any of these CAD programs, because it has been my experience that you cannot do everything with one program. We have another interview coming up about an actual professional sculptor artist who has embraced 3D printing in 3D printing ceramics. What you will hear in that interview is that she talks about how she didn’t learn CAD; she was going to waste years on learning CAD when what she really wanted to do is to help her vision expressed in 3 dimensions. So she worked with somebody she knew in CAD and gave her the direction she wanted to make in. She was really seated side by side with this person while creating all these things. They said that he even had to go back and forth between Z brush, Rhino, and one other program in order to accomplish all the things that she wanted to accomplish. There is no single bullet best CAD program. It depends greatly on the types of things you want to make, the type of whether amateur or professional you are, whether you are an engineer or more of a design and creative type, or you are just a young student learning something and you still do not know what you want to be learning. There is no right or wrong answer. Different CAD programs are either using primitives, or they are building things from 2D shapes and surfaces, or they are taking a virtual chunk of clay and curving into it, cutting from it. It is a subtractive modelling process for what becomes an additive manufacturing process in 3D printing which is very ironic because I find it really interesting. I hope that despite the great debate here of what these programs should or should be or could be that this is nonetheless helpful, I think Tinkercad is a very fine program, I admire it for a lot of things, and I don’t think Tinkercad 3D print software is a bad place to start. You might outgrow it very quickly, but that is great. You experience it, outgrow it, and you move on to the next thing. We will talk about what those things might be in the weeks or months to come. It is not as technical as some Tech Tuesdays are because this program does not have a whole lot technical to go into. It is very user friendly and very intuitive visually. But as we go into the others, we will go into a more technical discussion. Stay tuned for those.